A couple of years ago I repurposed an empty wine bottle to use as a vase for some spring branches. When I got it out to use this spring, I decided to give it a little update. 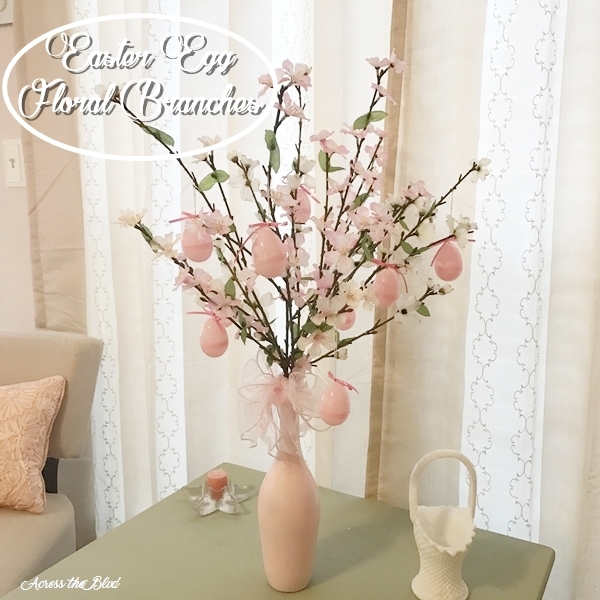 Now, I’m using it as an easy Easter Egg Floral Branches decor piece. Don’t toss your next empty bottle! 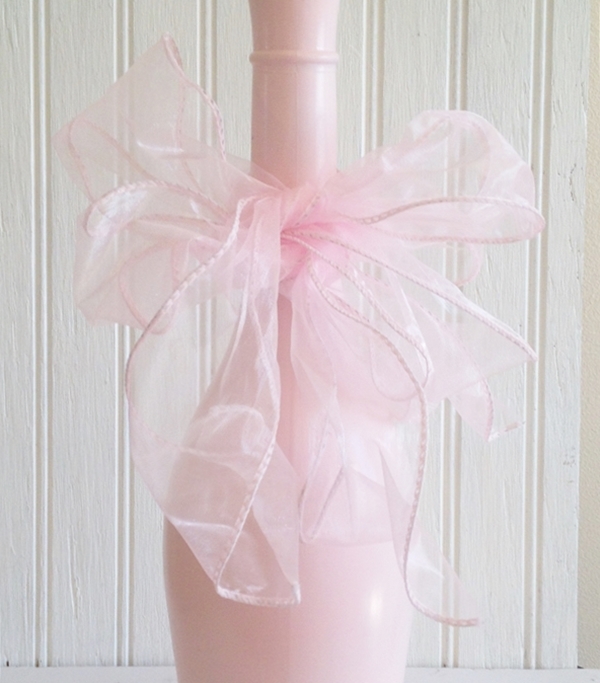 With a little paint and some ribbon, it can be a pretty spring time vase. I know I’m not the only one who buys wine because of the shape of the bottle. I love finding bottles that have shapes that I know can be repurposed. This wine was a Francis Ford Coppela Sofia Riesling. After washing the bottle and removing the label (I use nail polish remover) it was ready for painting. I used Krylon Cover Maxx Paint and Primer in Ballet Slipper. Once the paint dried, I tied two pieces of sheer pink ribbon around the neck into bows. I added the branches and spread them apart. I had some Stretch Magic Bead Cord in my craft stash that I used for the eggs. I ran it through the small holes at the top of the egg and tied it off into a knot. I trimmed the excess cord and looped the egg over a branch. 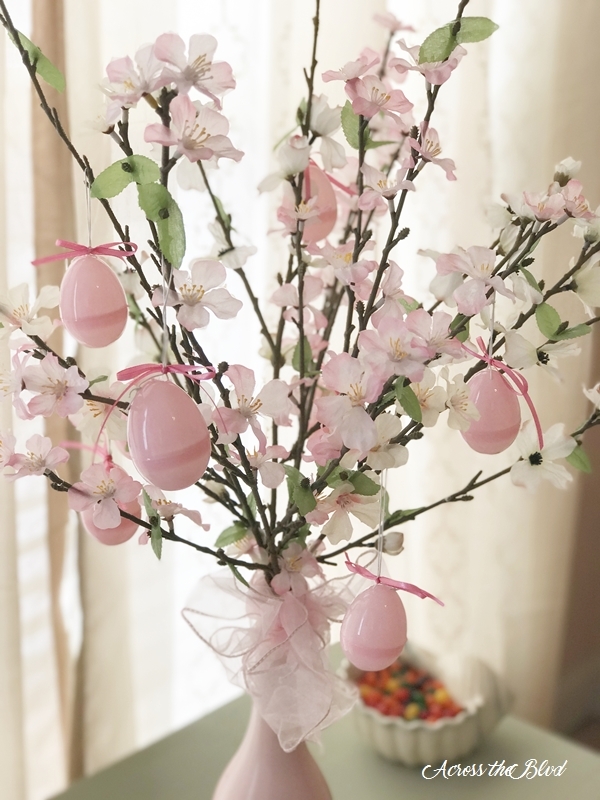 I added a small piece of pink ribbon, tied into a bow, at the top of each egg. This is such an easy repurposed project and I think it’s a fun piece of Easter decor. I love the pink and white florals. I bought them a couple of years ago at Jo-Anns Fabric and Craft. Of course, I used a coupon to keep the cost low. Before you toss that empty wine bottle, think about how easy it would be to turn it into a vase. This project was done in very little time, cost very little and adds some spring time color to my decor. That is a nice shaped bottle and so perfect for this project. I’ll have to look a little harder next time I buy a bottle of wine! The pink color is gorgeous with the white flowers! I think it would also make a beautiful centerpiece to the holiday table! Pinning and sharing! Thanks for linking up and sharing at Brag About It! I can’t believe it is the end of March!! Hope you are having a great week! Pinning and sharing! Thanks! I’m always checking out the shapes of bottles and jars before buying. 🙂 Thanks for the party and the shares! Beverly, I absolutely love this! It turned out so pretty. I think I’m going to have to make one for myself, now! 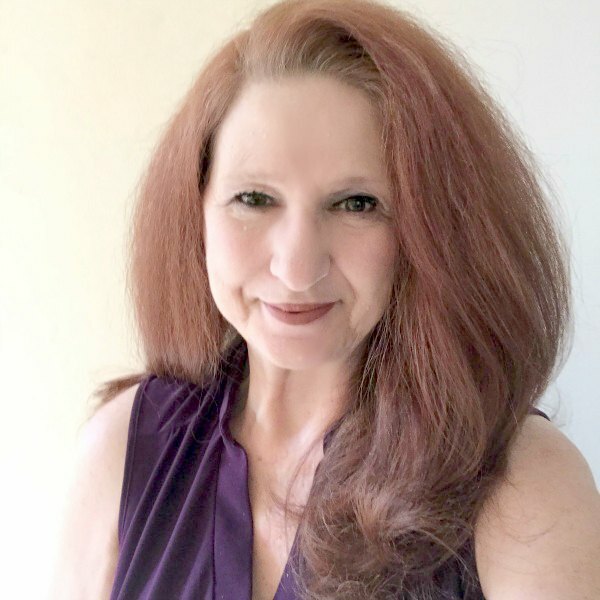 🙂 I’m sharing your post on Shoestring Elegance’s facebook page, I’ve pinned and Google +’ed too! I’ll definitely be Featuring this one next week. Thanks so much for sharing with us @ The What to do Weekends party, my friend! Happy spring! Thanks so much, Theresa! I’m delighted you like it. Thanks for the shares and for the feature! Happy Spring to you, too! Thanks so much for taking the time to stop by!! This is such a pretty project!! Thanks, Debbie. I appreciate your visits, too. Pretty bottles are a draw for me also. Depending on the price I may buy one and toss out the product. The shade of pink you chose is very soft and just right for this project. Thank you for sharing with us this week at Celebrate Your Story, and I hope you’re having a great weekend. Thank you, Sandra. I love repurposing bottle and jars. Thank you for hosting. I hope you’re enjoying your weekend! You created a lovely centerpiece for Easter. Love that you picked pink. Pinning and tweeting. Thank you, Sharon. I like using soft pink for Easter. Thanks so much for sharing. Thanks, Leanna! I like the colors, too. Thanks for pinning! WOW! What a difference the paint made! Doesn’t even look like the same bottle. Love the color and flowers you chose. Thank you Beverly for sharing this post at the #BloggingGrandmothersLinkParty. I shared it on social media. Spray paint is a crafter’s best friend! Thank you, Dee! I appreciate the shares. Hi Beverly, I love to upcycle bottles and jars. This is so pretty and springy. Thank you for sharing at the #BloggingGrandmothersLinkParty. I have shared on social media. It’s fun to find new uses for bottles and jars. Thank you, Clearissa. Thanks for the shares! Thanks, Arianne! I love finding things to use that are inexpensive and easy to put together. Thanks so much, Leanne! It’s such an easy project. I’m happy to have given you some inspiration! I love this easter craft Beverly. Thanks for sharing it at C&C with J&J! Thanks, Julie! Thanks for the party, too. This is a great upcycle! I love the shade of pink that you chose for the bottle. 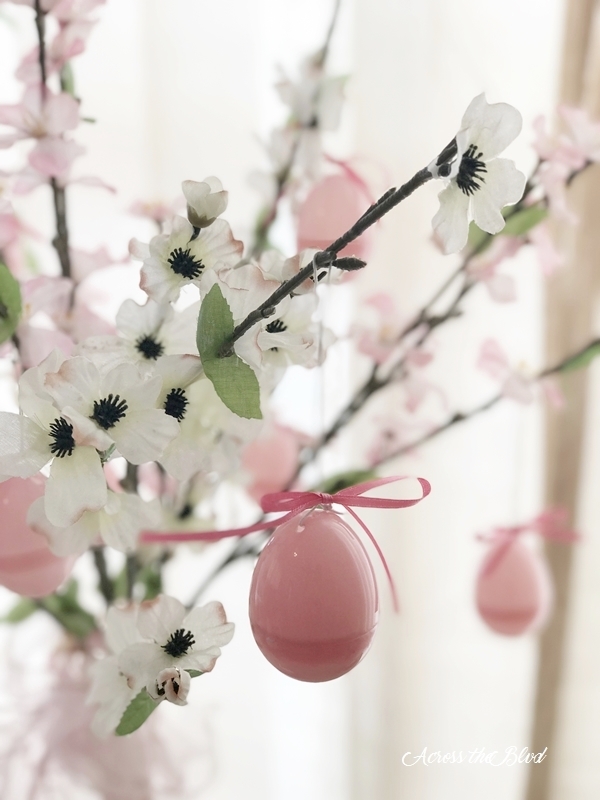 The Easter decorated branches look so sweet and feminine. Thank you, Carol! I love soft pastels for Easter. Gorgeous. I just love that shade of pink! Thanks, Cathy. That shade of pink is my favorite to use for Easter decor. I do something similar but my colors are always yellow. Love how pretty this is. Thank you for linking up with #BloggingGrandmothersLinkParty. I have shared your post. Thank you, Candy! Yellow would look very pretty. Thanks for the party and the shares! So pretty! Thanks for sharing this!! I saw your feature at Celebrate & Decorate and had to stop by. Glad I did…this project looks terrific and seems like something even I could do – not “crafty” at all! Love pink and white decor for Easter this year! Thank you! It’s an easy little project to put together in no time! 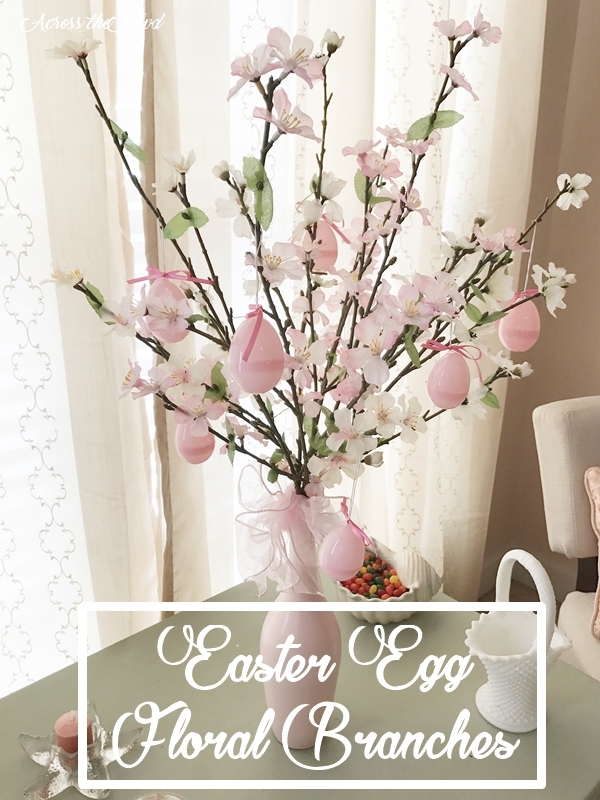 I love using pink for Easter decor. I love the soft pink of the bottle and the florals. It’s the perfect spring arrangement. Thanks for sharing on Sunday’s Best. Thank you, Rhonda. I’m enjoying this shade of pink this year for my Easter decor. Thanks for the party each week! I just love this and the colour is perfect. So easy but so effective. Thank you for sharing with us at Over the Moon Link Party. I’ve pinned and shared. I hope to see you link up next week. Thanks, Sue! I appreciate the party and the shares. Thank you for sharing this post on the Simply Sweet Home Linky Party. You were my choice for this week’s Friday Favorite Feature. What a fun way to add some fun to your Spring/Easter Decor!! 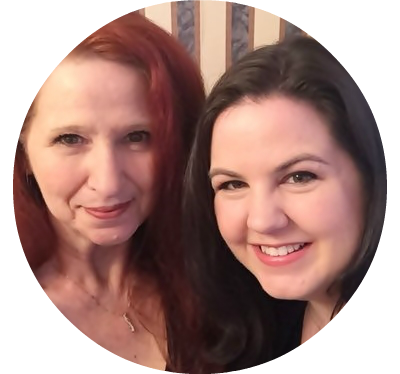 Please feel free to come by and grab the I’ve Been Featured Button for your page. Thanks so much, Sheree! I’m delighted to have you feature this! Thanks for hosting. I’ll be sure to stop by. I love that shade of paint, too. Thanks, Shirley. Dogwoods and cherry blossoms are pretty. Thanks for the party! 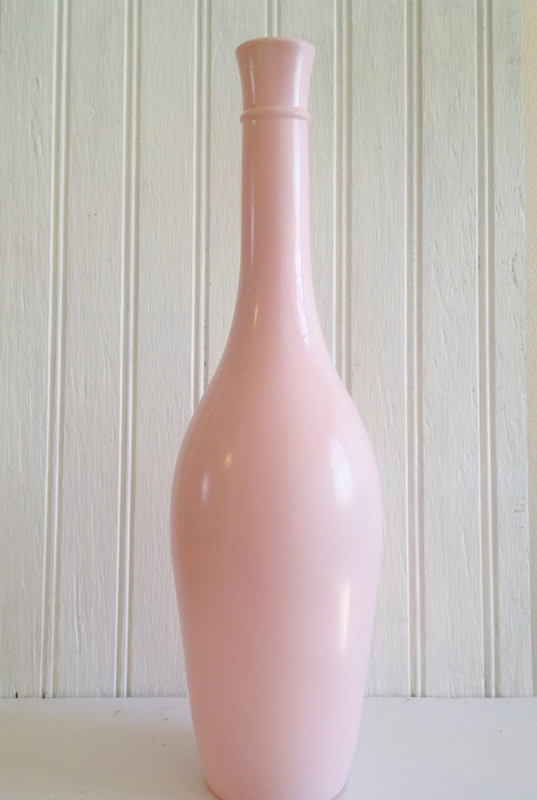 That shade of pink is perfect for your bottle-turned-vase! The whole arrangement is so pretty. 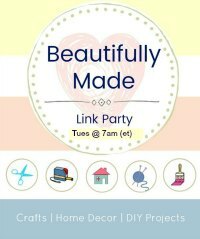 Thanks for linking up with Merry Monday – I’ll be featuring your decor in this week’s party, which goes live Sunday evening. I hope you’ll link up with us again! Thank you, Emily! I’m delighted this is one of your features at Merry Monday! This is beautiful! I love how something so simple can be transformed into something so elegant. I love the pale pink. In fact, I didn’t notice the eggs at first glance, they are so subtle, and when I did I had to smile. They add just the right amount of whimsy. Pinned! Thanks for sharing at My Busy Beehives #linkparty this week! Have a great weekend! Thank you, Julie. 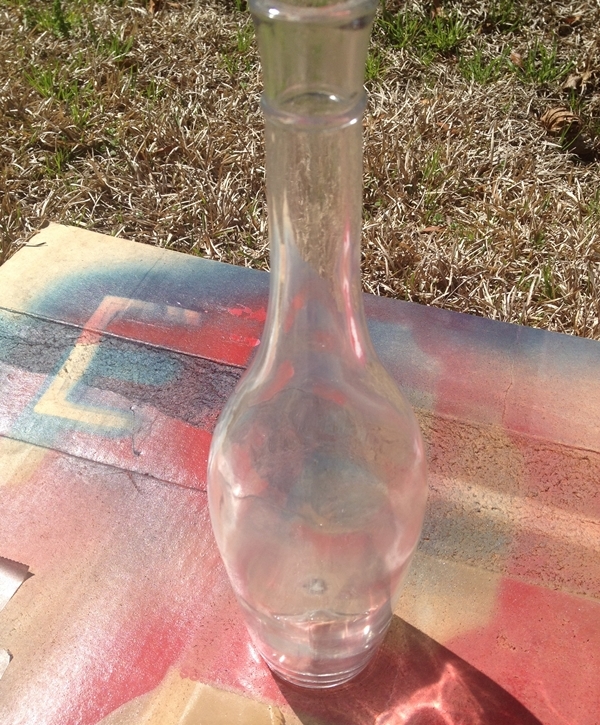 I enjoy taking things like this bottle and giving it a new, purposeful look. Thanks so much for the party and for pinning. Thanks for the party, Helen! Beverly this was simple but with such a lovely impact. I love the pastel feel to the Easter egg project. Pinning. Thank you, Mary. I love the simplicity of it. Thanks so much for pinning! This is so pretty! I love that all your eggs are pink. It gives it a soft subtle look. Thanks for sharing st the #BloggingGrandmothersLinkParty! Thank you, Lori! I love the soft look, too. Thanks for the party! Thanks so much! I appreciate the feature and the party!